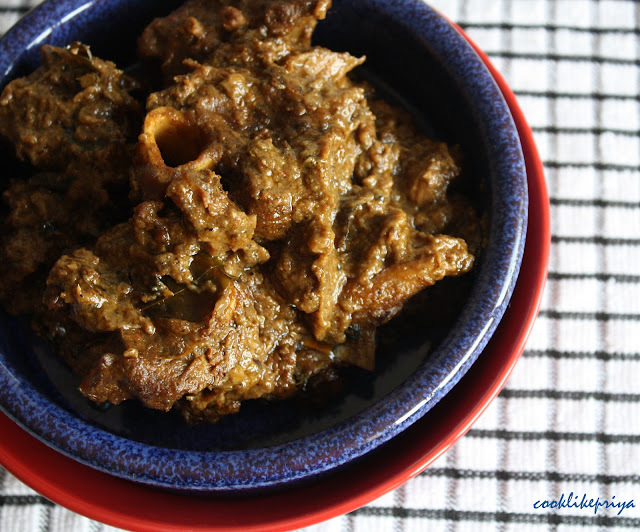 Lamb pepper fry is packed with spicy, rich flavors and is super easy to prepare. It requires a good cut meat, you can use baby lamb shoulder / goat (mutton) for this recipe with/ without bones. 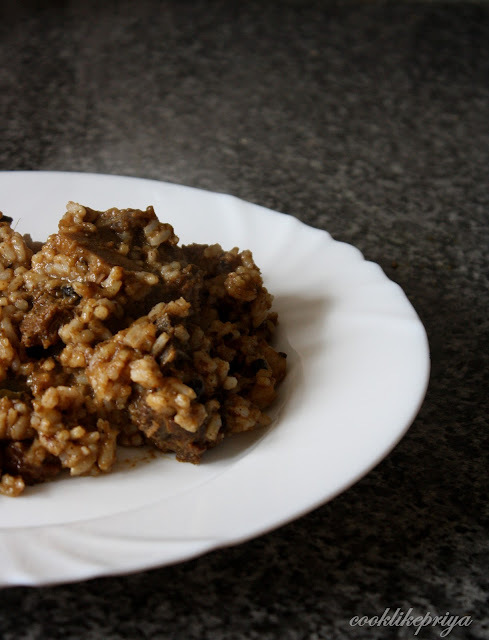 Its a side to go along with rice/ chapatti but the way I love it is a kadai rice, where the left over masala is been tossed with rice and relished to the fullest. 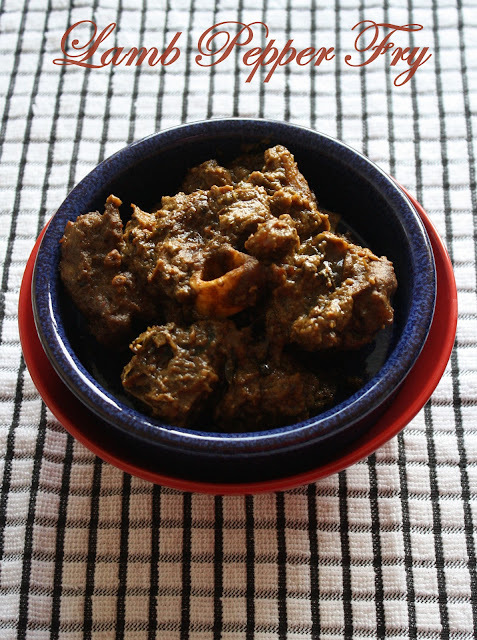 I got this recipe online and to my surprise this is one dish that I make every time I but lamb it is so good and something that you will end up doing again and again. 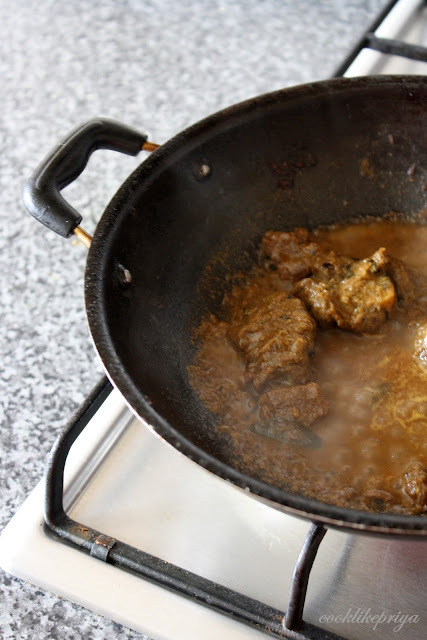 In a pressure cooker heat oil and add the whole spices - cinnamon bay leaf, jeera as they start to release aroma add the onions, turmeric and let it caramelized it should take a minute. To this add the lamb and mix well, add 1 cup water and close the lid and place the knob/weight and let it pressure cook for 4-5 whistles until well cooked, let the pressure gradually settle. simple and too spicy :) my kind of recipe.. I am going to try this on coming Sunday. Looks so tempting! I can enjoy thoroughly this pepper fry with hot steaming rice. Looks great priya! Hope you enjoyed it. Priya, that is such a lip smacking recipe, super like!